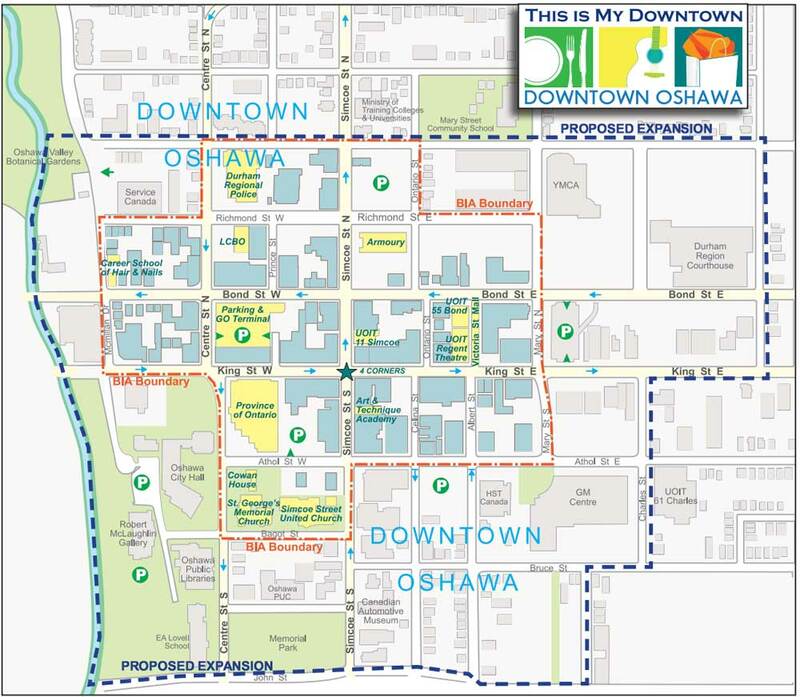 The proposed downtown Oshawa BIA expansion will increase the current 20-block BIA area to approximately 36 and will move the boundaries to William Street in the north, John Street in the south, Division Street, Charles Street and Court Street to the east, and Oshawa Creek to the west. The downtown Oshawa business improvement area (BIA) is looking to do something it hasn’t done in more than 40 years: expand. Established in 1974, the BIA has kept the same boundaries throughout its entire stint of operation, which consists of approximately 20 blocks of Oshawa’s downtown core and hundreds of businesses. According to councillor Doug Sanders, who is a member of the BIA committee, this proposal is a positive thing, as it could allow the BIA to expand not only its boundaries, but also its budget. Currently, the BIA’s budget is restricted to $143,000, as set out in the city’s BIA bylaw. However, with an expansion that includes as much as 86 more businesses, the bylaw could be changed to allow the BIA a larger budget, and therefore more opportunities. Businesses within the BIA pay fees along with municipal taxes. These fees are what make up the BIA’s budget and are put towards beautification, lighting, safety improvements, as well as promotion and marketing efforts for the businesses in the downtown. As well, BIA members receive additional services such as different garbage pickups. “On $143,000, many BIAs have actually folded as a result of not getting budget increases,” Sanders says. The BIA’s budget has not been increased since the bylaw was amended in 1991. At that time, the bylaw changed to allow a budget increase from $135,000. The proposed boundaries, which could see the BIA grow to 36 blocks, would stretch to William Street on the north end and John Street to the south. The east boundary would be made up of Division Street, Charles Street and Court Street, while Oshawa Creek would form the west boundary. The boundaries are slightly changed from the BIA’s first request to expand, which came in October 2013. The BIA will now be holding two public open houses for existing and potential BIA members to gather feedback on the proposed expansion. The Municipal Act, which states all parties involved must be notified of the proposal, governs BIA expansions; the bylaw must be changed to state the new boundaries. The BIA also cannot expand if within 60 days of notice, at least one third of the businesses come forward and object to the expansion. Sanders says the public open houses will be a chance for the BIA to present their case to surrounding businesses as part of an open and transparent process.